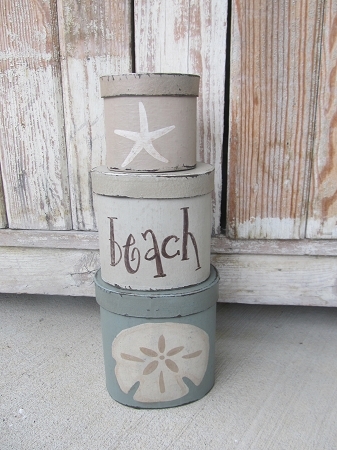 Nautical Beach Coastal Sand Dollar and Star Fish Oval Set of 3 Stacking Boxes. 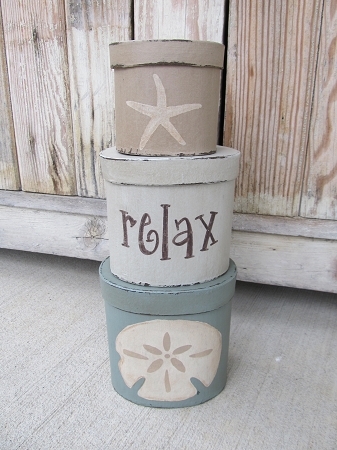 Love the sea glass colors that I used in this stack box set. The bottom box is painted a Agave color, a shade of the ocean. It has a sand dollar painted on. The middle box is a light blue, called OffShore Mist. That has the saying hand written on in brown. Shown with Relax and second image Beach. Top box is Mesa Taupe, with a star fish painted on. Each box was sanded and stained for a rustic worn look. When stacked, the paper mache boxes are 12" tall with the bottom oval being 5"x2". Great accent for shelves, cabinets, bathrooms, bedrooms and more. Hand painted, designed and signed by Heidi.